rigorousintuition.ca • View topic - FIRST THING for the new prez, set the israelis up. 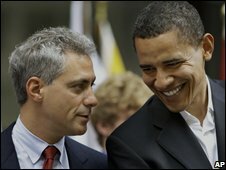 the FIRST appointment obama makes is rahm emmanual, an AIPAC supporter, those nasty zionist cockroaches..
israelis first, everyone else second! the zionists really do have incredible power in america..
trouble is, i don't think obama WILL be a "change"..he's just a slightly more tanned american than the last one..
btm, also a "tough and aggressive" zionist, who is "an aggressive operator", who'd have thought it. fucker. The man set to become President-elect Barack Obama's chief-of-staff is a congressman regarded as a key Democratic strategist and fundraiser. Illinois Democratic Representative Rahm Emanuel, 48, is also known for his tough and aggressive style in the political arena, and has been dubbed "Rahmbo" by some US media. A dedicated family man with a wife, Amy, and three young children, Mr Emanuel has publicly pondered the impact on his family of accepting the chief-of-staff role - a job involving long days and high pressure. The chief-of-staff acts as the president's most senior adviser and right hand man, counselling him and attempting to get his proposals passed by Congress. He also guards the door to the Oval Office and needs to be able to say 'no' when the president needs him to. Some Washington observers have portrayed Mr Emanuel as the "bad cop" to Mr Obama's "good cop". Mr Emanuel certainly has experience in the daily grind of cajoling sometimes reluctant congressmen to fall in line. Regarded as a centrist Democrat, he was an important player in the recent passage of President Bush's $700bn (£440bn) financial bailout plan, helping to mobilise Democratic votes to pass the measure. He has had a rapid rise up the party hierarchy since his election in 2002 as congressman for Illinois' Fifth District in Chicago. In his second term Mr Emanuel served on the House Ways and Means Committee, which is responsible for overseeing taxes, trade, Social Security and Medicare issues. He was appointed to serve as Chairman of the Democratic Congressional Campaign Committee in 2006. Under his leadership, the Democrats gained 30 seats in the House of Representatives, allowing them to gain control of the House after 12 years of Republican control. In 2007, he was elected to serve as the Democratic Caucus Chair, the fourth highest ranking Member of the House Democratic Leadership. Stories of Mr Emanuel's focus and determination are widespread around Washington and Chicago, and he has developed a reputation as an aggressive operator. He once confessed to the Chicago Tribune that he was acutely aware of how others thought of him: "I wake up some mornings hating me too," he told the newspaper. Rahm Emanuel's father, Benjamin, is an Israeli-born doctor who was once a member of the Irgun, a hard-line group which fought for Israeli independence until 1948 as was branded as a terrorist organisation by the British colonial authorities. The prospective chief-of-staff himself volunteered to serve in Israel's army during the first Gulf War of 1991 - rust-proofing brakes in northern military bases, Israeli media reports. Back in the US, Mr Emanuel became the director of finance for Bill Clinton's presidential campaign in 1992. He then went on to serve as a senior adviser to President Clinton from 1993 to 1998 - first as an assistant to the president for political affairs and then as senior adviser for policy and strategy. After his time in the Clinton administration, Mr Emanuel became a managing director for a leading global investment bank in Chicago, reportedly earning $16m. Mr Emanuel worked on Paul Simon's 1984 US Senate election and served as an adviser and chief fundraiser for Chicago Mayor Richard M Daley in 1989. He graduated from Sarah Lawrence College in New York in 1981 after turning down a dance scholarship. He received his Masters in Speech and Communication from Northwestern University in 1985. He launched his political career at consumer rights organisation Illinois Public Action. Profiling Mr Emanuel in Rolling Stone magazine in 2005 - in an article headlines The Enforcer - former Clinton staffer Paul Begala described Mr Emanuel's presence in Congress in reverential terms. "He's got this big old pair of brass balls," he said. "And you can just hear 'em clanking when he walks down the halls of Congress." James Carville, who ran Bill Clinton's 1992 election campaign, is another who has backed Mr Emanuel to succeed as chief-of-staff. "He was bred for this job,'' Mr Carville said. "How many chiefs of staff have this kind of experience?'" if the israelis are happy then it must be wrong. 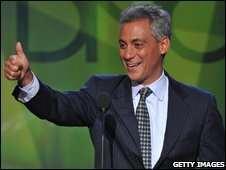 bigearth wrote: Rahm Emanuel's father, Benjamin, is an Israeli-born doctor who was once a member of the Irgun, a hard-line group which fought for Israeli independence until 1948 as was branded as a terrorist organisation by the British colonial authorities. so HIS FATHER WAS A TERRORIST. bigearth wrote: The prospective chief-of-staff himself volunteered to serve in Israel's army during the first Gulf War of 1991 - rust-proofing brakes in northern military bases, Israeli media reports. this guy is so "american", that he signs up to serve in the israeli death farce army? ..and he's your new prezdent's "chief of staff"? "yes we can", but "we probably won't". AMERICA GET YOUR COUNTRY BACK FROM THESE ZIONIST TURDS! Last edited by bigearth on Sat Nov 08, 2008 9:41 pm, edited 3 times in total. Hey bigearth-just wanted to check in and say thanks again for keeping the updates coming-Jeff's new post is great -love the last few sentences! I am having really bad health problems right now -hope to be able to be online more soon. I go through withdrawals without Rigorous Intuition. And yes- you could not be more right-Jeff's latest pretty well sums it up-We Need Real Change! No more fascism friendly or otherwise!